Your account uses important data settings to manage things like your time zone, currency, company information, notifications, and more. Your default information affects what you see and do in your account, from sending email campaigns to billing. Users with Admin level access can enable notifications to send an alert via email or SMS when a change is made to these settings. This is optional, but recommended for account security. In this article, you'll learn how to change the default settings for your account. You can change your settings at any time on the Details page in your account settings. On your account Details page there are a few sections where you can set default settings. If you add or alter information, you’ll need to click Save to save changes to that specific section. In your account Details, you’ll view or change your account name, set your time zone, choose a preferred date and time format, and a default currency format. View our update your account name. This is not visible to contacts. Your account name appears at the top of your profile menu and on the login page if you use more than one account. Use the drop-down to set your time zone. 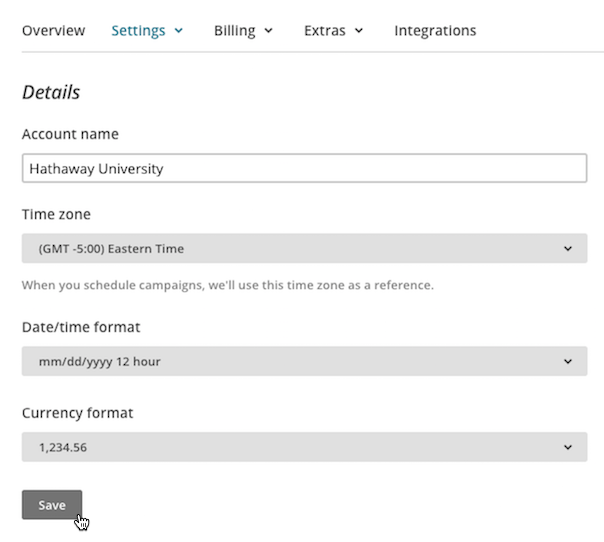 We'll use your time zone to display times for email campaigns and automation email sends, list imports, and contacts’ signup times. Choose the date and time format (MM/DD, DD/MM, 12-hour, 24-hour) that appears throughout your account. Dates and times will display in campaigns, list creations, and date fields in a list. Date fields imported into a list will also reflect the account's default date and time format. Default currency format that appears on the Billing pages in your account. If you're an agency, or you help other companies use Mailchimp, check the I’m a marketing agency box to turn on your agency status. 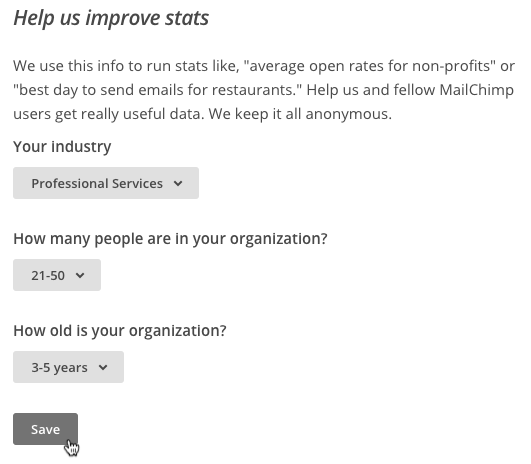 We use this kind of general, anonymous account data to help Mailchimp tools make better recommendations. For example, we might use this data to help us determine things like the best times to send a certain type of email campaign, or how your open rate compares to similar companies. 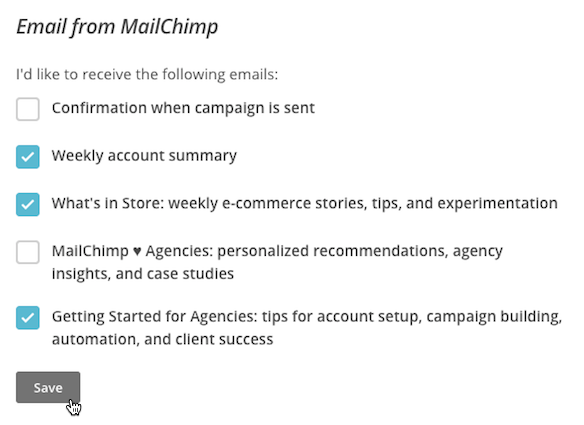 In this section, you can choose what kind of emails you want to receive from Mailchimp. Choose which account notifications and newsletters you want to receive to help you send email campaigns, keep up with your contact lists, and improve your email marketing.